Here is a simple solution for a common problem: where to put your cellphone while it is being charged. 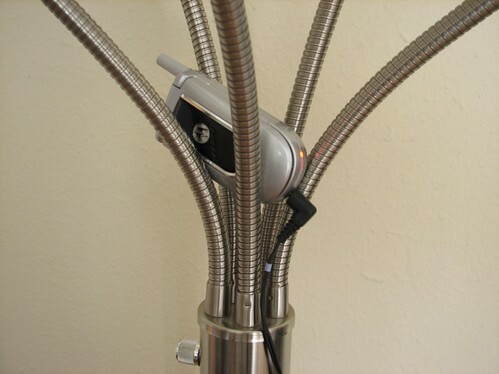 This multiple gooseneck floor lamp (aptly named “Hydra,” available at Home Depot) can do double duty as a cellphone charging stand, freeing up valuable shelf or desk space for more important uses. It nestles your gadget inconspicuously out of the way but still readily accessible while charging. One caveat: this lamp has a dimmer switch, and we haven’t yet found reasonably priced dimmable compact fluorescent bulbs, so bulb options are limited to incandescent or extremely expensive. Less simple but arguably more cool and worthy of a mad scientist would be an art project involving this. 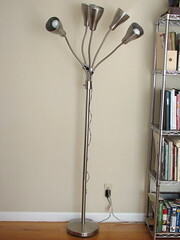 Dude…totally have this lamp and use it for this exact purpose. Awesome.